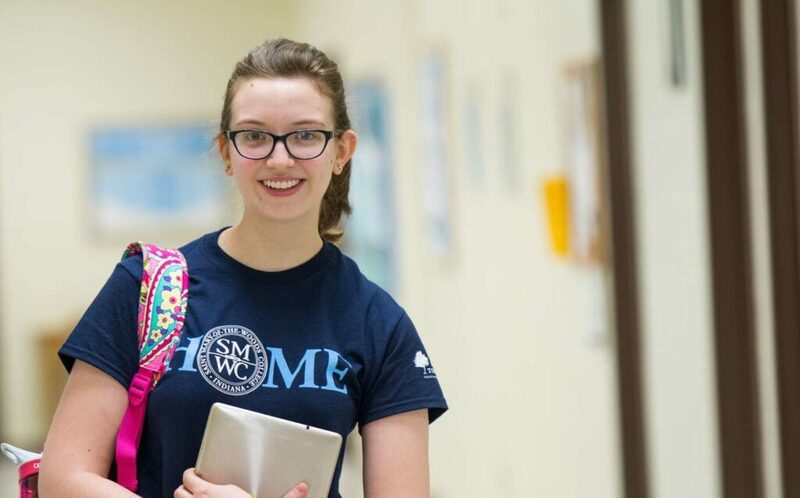 Expand your career path with a professional writing degree from SMWC as a traditional on-campus student or in our online degree program. Are you creative? Do you find satisfaction seeing your ideas on paper? With a professional writing degree, you will gain advanced skills in writing for diverse audiences and disciplines. Along the way, you will also develop your identity as a writer of creative work—poetry, nonfiction and fiction—while understanding what writing skills employers seek in today’s world. Hands-on learning experiences in and out of the classroom are designed to help you develop marketable skills and graduate with a portfolio of professional-quality work. You will enter the workforce with solid liberal arts fundamentals – critical thinking, problem solving and communication – all to give you a competitive edge to excel in your chosen career. The professional writing degree is a combination of technical and creative writing as well as some journalism. Designed to promote writing ability applicable to any field, coursework involves the development of advanced research, critical analysis, and presentation skills. While a range of communicative media are employed throughout both major and minor, coursework is developed in the context of the digital workplace in order to provide students with depth and breadth of experience that extends well beyond basic digital literacy. Prerequisite: Students wishing to enroll in Professional Writing must earn a minimum “B” grade in EN 111. 43 Credit Hours required; Must complete six (6) additional credit hours of electives. EN 150 must be completed three times for a total of three credit hours. A study of how the media affects multiple aspects of our lives. Students will explore definitions of mass media, forms of mass communication, and societal, ethical, and legal issues that mass communication raises for the present and the future. Campus: Fall, every year. WOL: Fall and Spring, every year. The course focuses upon editorial fundamentals, including appropriate use of grammar and mechanics, professional research, and the application of multiple writing styles. Through a range of writing and editorial projects, students will develop skill and voice as they hone the ability to write clearly and concisely for a range of audiences and purposes. Prerequisite: EN 111. Course Fee. Students participate in the production of the College’s publication, the Aurora. Course may be taken more than once. Introduces techniques in writing fiction, drama, poetry, and certain kinds of expository prose. Satisfies English Education, professional writing, and creative writing requirements. Building upon the foundation established in Professional Writing I, Professional Writing II provides students with the opportunity to develop and produce work in a range of writing projects across both academic and professional genres. From essays and reviews to profiles and proposals, students will create a range of documents that directly reflect rhetorical situations encountered in the professional work place as well as academia. In addition to the requisite research and writing, students will produce personal and web-based presentations of their efforts. Prerequisite: EN 111 (Completion with a minimum of a “B” grade) and EN 157. Students will read and discuss nonfiction literature covering a range of contemporary topics. In addition to study of technique and narrative style, students participating in the course will have the opportunity to write about and present their observations on how selected writers and journalists have expressed themselves along with the cultural impact of their writing. Spring, even years. Provides an overview of the public relations function, plus an examination of the practice of public relations in business and industry, education, politics and government associations and professional societies, health care, voluntary agencies, churches and the arts. Prerequisite: EN 101. Students participating in the Professional Writing and English majors will have the opportunity to complete coursework formally identifying and developing their individual Senior Thesis/Capstone Project. Students will select and work closely with a faculty advisor as they perform research and develop supporting material for the Senior Thesis/Capstone Project. Text/materials will be specific to the individual student’s project. This course focuses on the continued development and refinement of skills introduced in Professional Writing (EN 257). Coursework will include elements of academic, creative, and technical writing employed across a range of styles. Students will have the opportunity to develop coursework in a fashion that will best compliment their academic and future career goals. Prerequisite: EN 257. Offers students guided practice in writing essays in a flexible, contemporary genre familiar to readers of memoir and literary journalism. Students draw on personal experience to produce essays that are conversational in tone and non- traditional in structure and may also include factual report or research. Spring, odd years. 6 credit hours required; Students must select and complete one lower– and one upper-division course for a total of six credit hours. Please note that these may include courses in English, Art, Graphic Design, Media Art, History, etc. in order to best develop the student’s individual course of study. Course selection must be approved by student’s advisor. The professional writing minor requires 24 credit hours of English related coursework. 24 credit hours required; all courses listed. EN 150 must be completed three times for a total of three credit hours.